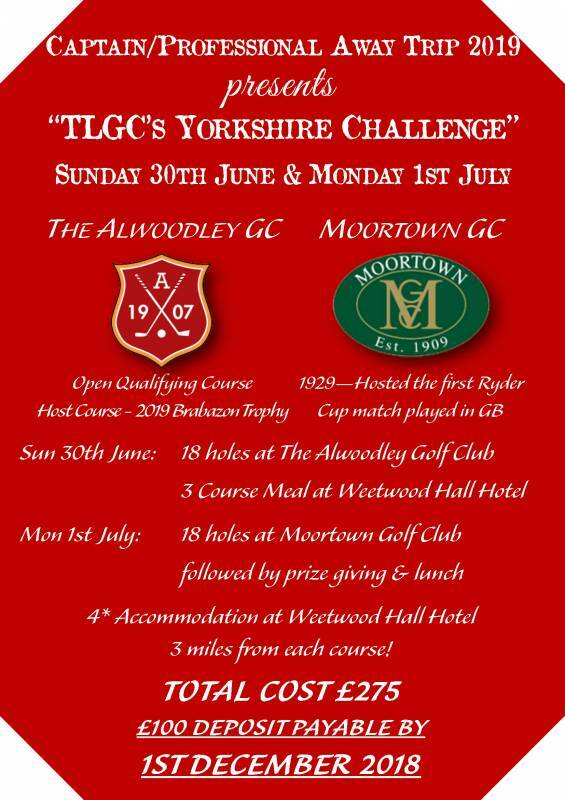 Founded in 1907, The Alwoodley GC (https://www.alwoodley.co.uk/) was designed by Dr Alistair McKenzie and regularly features in the UK’s top 100 courses. Set in heathland/moorland, the club currently hosts The Open regional qualifying and, shortly before our visit, hosts the Brabazon Trophy – the English Amateur Open Stroke Play Championship to give it its full title. Formed two years later, Moortown GC (http://www.moortown-gc.co.uk/club.html) is also a top 100 course and, like The Alwoodley is a McKenzie course set in heathland/moorland and has hosted The Open regional qualifying. It staged the Ryder Cup in 1929, the first to be played in the British Isles. The GB&I team included Percy Alliss and Henry Cotton and beat the US team, which included Gene Sarazen and Walter Hagen, by 7 – 5. Among the more recent champions are Danny Willett who won the Yorkshire Amateur Championship in 2007, and Nick Faldo, who won the Car Care Championship in 1984. So, two superb courses packed with history and tradition are waiting for us. Accommodation is at the Weetwood Hall Hotel (https://www.weetwood.co.uk), a four-star hotel situated within 3 miles from each course. 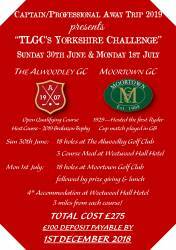 Sunday 30th June: Travel to The Alwoodley in time for a 12.00midday tee off - a four ball better ball competition followed by a three course dinner at the Weetwood Hall Hotel at 7.30pm. Monday 1st July: a leisurely breakfast at the hotel followed by a further four-ball better ball competition (partners to be drawn at the dinner) starting at 10.00am. A two course lunch and prize giving will follow before making our way back to Leicester. The trip is open to both gentlemen and lady members and, by making these arrangements well in advance, we have been able to secure costs at 2018 levels. The cost of the trip is £275 and 40 places are available. These can be reserved with Peter Livie or Kym Larratt in the pro-shop upon payment of a deposit of £100 (by cheque made payable to The Leicestershire Golf Club, by debit card or by bank transfer under reference Yorkshire 2019).